I have never never never created things from so much pink stuff. The dusty pink fabric for Weigel's 1941 was fine, it had a sheen to it that was kinda grey. 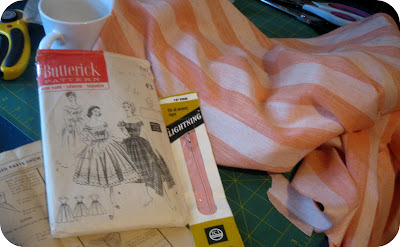 Yesterday I sat down with 3 pieces of fabric, yellow, greeny yellow and pink stripes, to measure out what was needed for Butterick 7181 and this must have been the glory days, oh yes indeedie! For the skirt I measured out 100 inches (I prefer using inches because they're a lot meatier and you can always remember the numbers more that 84 cms or whatever) around the waist! Lots of darts and lots of gathering! So I had to choose PINK again for this dress, as my yellow and greeny yellow checked material had hardly enough material to make half that skirt! The pink stripes is from the Salvo's in Tempe and I remember buying it last year thinking this is the LAST time I'm buying fabric from this place BECAUSE they really run the costs up in the giant warehouse. 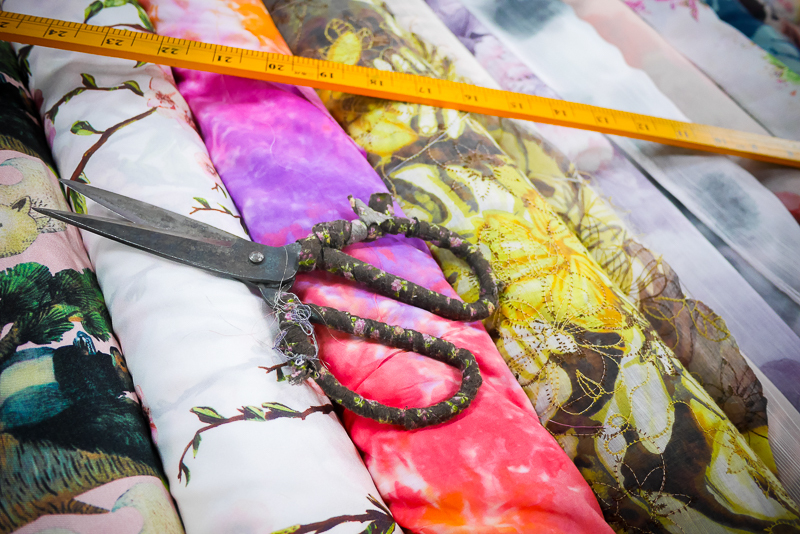 You know how you can leave with 5 bits of fabric for $10 or so, from a normal op shop? This place you'll buy the same bits and it'll cost $50. I know it's all charity driven etc, but as my sewing is a hobby, and not a profession, I'm not out to spend a lot! I just can't afford to go there! Anyways, this is kinda linen pink stuff, and kinda soft and a little bit see through. So! Yesterday, before I cut it all out I measured the length I wanted for the skirt, since this was going to take up most of the fabric, I mapped it out (100 inches by 20 inches) and cut that first. Then I looked at the rest of the pattern pieces and saw that the facings were only very thin, and considering my fabric was so light... I decided to line the bodice with spare pinky drill I had in the stash. Putting together the bodice took AGES because I had to look at it, and then look at it some more. Then I went and played some computer games. Then I came back and looked at it with the sleeves pinned on. I looked at it some more. I pinned the whole thing together and folded it out (the lining of course wasn't as straight forward as I thought, and I had to get the sleeves involved without sewing up the wrong bits!)... and I felt like I could do it! Yippee! The lining has given it a bit of stiffness too, because how the hell does it stay up? The sleeves drop down past the shoulder (I've named this the 'Rochelle, Rochelle' look after Seinfeld) so the bodice needs to be kinda stiff and fitting to stay up! It looks great hey!??? The buttons are from the stash too, and were rather tricky to put on for some reason. I, of course, forgot the interfacing along the holes so it's a bit flimsy. OH WELL! And here's the side without the zipper. How much gathering is there??!! So, it's a pretty goodlooking dress so far, but I'm totally OVER pink. I don't even know if this is for me now either, as it's pretty syrupy and I don't really tend to wear these kinda colours. Hopefully I'll finish this today, before I go to the Laneway Festival. It's changed locations this year, so perhaps it'll be fun. Not sure if 'Rochelle, Rochelle' is up for a music festival yet! I love love love it! The color is so pretty I could see it going well with a teal belt and really colorful shoes. Wow! 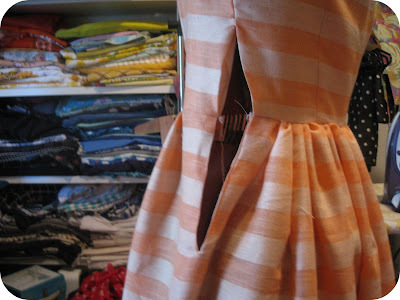 I can't believe how quick you made this dress after the wiegels one. I personally love the fabric. I am really into the super girly girly colours and prints. If it was my size I would totally buy it. Can't wait to see it all finished. Wow, this looks awesome, can't wait to see it finished! love the stripey fabric! I'm with you on the priceyness of the salvos at tempe, they are much dearer than anywhere else but on the other hand they always have stacks of fabric whereas other stores sometimes don't. Not that you (or me) need any more fabric I'm sure!